Growing up on his grandparents’ ranch in rural Mexico, Lucino Sotelo never dreamed of anything more than to help his grandfather farm and herd cattle. His sights changed, however, when he immigrated to the United States to be with his parents at age 10, quickly learning that survival instincts paired with hard work yielded positive results. Mentors, tenacity, and good luck soon landed Sotelo into renowned universities and lucrative positions. Now, as head of digital marketing for Grant Thornton LLP, one of the leading global audit, tax, and advisory firms, Sotelo leads a team that is dedicated to advancing the firm’s digital vision and strategies. He shares with Hispanic Executive his insights into Grant Thornton’s digital transformation. 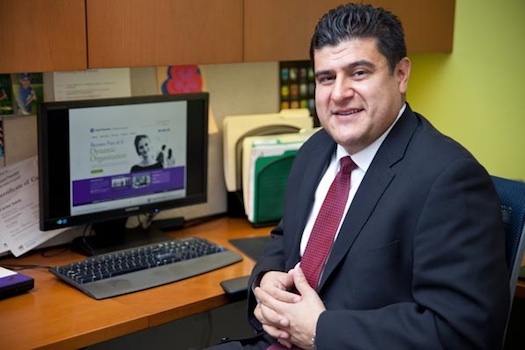 When Sotelo came to Grant Thornton, he set out to transform the firm’s website, focusing on its functionality, usability, social engagement, mobility, and visual presence. First, his team conducted a thorough requirements-gathering exercise, incorporating the input of the primary website users and key internal stakeholders. Sotelo’s team then selected a market-leading content-management system and a robust marketing-optimization capability to achieve the firm’s revenue-growth goals, and built the site to be responsive to any device—from a smartphone to a tablet to a laptop—so that the content changes and displays accordingly to the device. Lastly, the new website integrated all relevant social-media platforms such as LinkedIn, Twitter, Facebook, and YouTube. “Our goal was to optimize and tailor the experience to the user so that they could have the most relevant, positive, and engaging experience possible,” Sotelo says. How do you unwind in your downtime? By spending quality time with those who are important to me, be it taking my children to sports practice or games, a good round of golf with my friends, watching TV with my wife, or playing poker. What talent would most people be surprised to know you have? My wife and I both love to dance! My sports talents have disappeared, so now I’m more of an aspirational weekend golfer and avid Chicago sports fan. I played basketball, baseball, and boxed when I was in high school, but was better as a punching bag than a genuine challenger. If you were stranded on a desert island for a week, what three “luxury” items (assume you would have food and water) would you need to have? A fully stocked and fully fueled yacht with my wife and kids, my golf clubs, and my iPhone. Riding horses and tending the cattle with my grandfather on my grandparents’ ranch in Mexico. Living on a ranch was a great childhood experience. Also, eating my grandmother’s cooking—no one can cook like my grandmother! Going on a safari in Africa. I love nature, animals, and that is one area I have not visited yet. In a firm filled with exceptional and talented leaders who are really good at their professions, Sotelo found an opportunity: How do you engage the organization in digital marketing and help your team take better advantage of digital-media opportunities? He found the answer was to create a series of educational forums to teach employees how to leverage and optimize to accomplish the company’s business goals. With the content in place, Sotelo’s team went on to train key staff on different digital marketing techniques to target and attract the desired audience. “At the end of the day, my team and I cannot be the experts on each area of business for the firm, but we can teach the experts how to optimize and leverage the most relevant digital channels more effectively,” he adds.